So Jacob is not napping... it's a fine time, I gotta get caught up on blogging. Sunday was a continuation of Annie's birthday party at my Dad's. It was also kind of a last hurrah for all of us to be together one more time before the West family moves back to Texas. 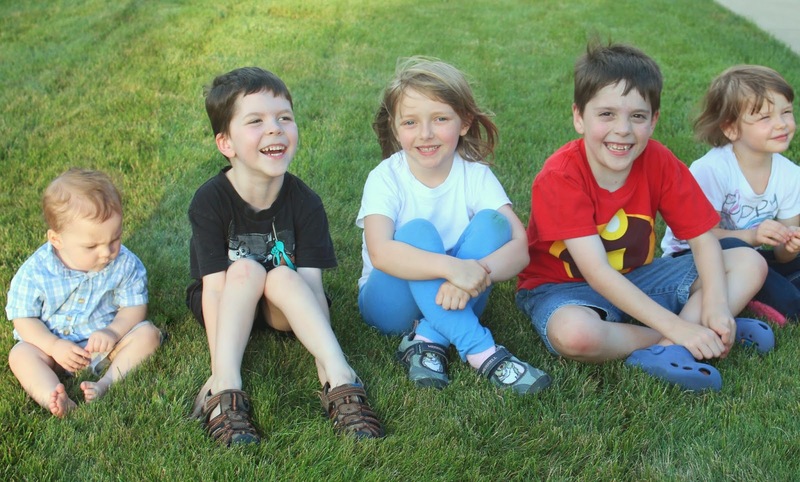 But boy howdy, when we get all five grandkids together, it's hard to tell which one wins, the Cuteness, or the Crazy. The girls had to show us right off their favorite game, Climb Daddy-Chair's feet. Wow - that brought back the memories, I used to sit on my Uncle's feet all the time, riding around the room on his feet, those were good times. Oma made a Texas sheet cake...in a 13X9 pan. And completely covered it in candy pearls. so she did got to blow the candles out again! Annie loved eating her cake. And Charlie didn't do her bisecting head trick for me, but she was pretty cute. Jacob figured out to use the cup of water, and he was thrilled too. No one listened to Lisa and not get Annie presents. Cousin Suzy got Annie a butterfly net for her birthday. And Meb got her some stretchy sparkly jewelry, 6 must be the age for that. After all the sugaring, we let the kids out to run it off. Only they didn't. Chris was reading his Lego movie book to the kids just sitting on the sidewalk. We lined up all the crazy for some pictures, but it was hard to get them all to smile. But we got a little lucky. Then we laid them all down in hopes of getting a better shot. We just got a little more crazy.